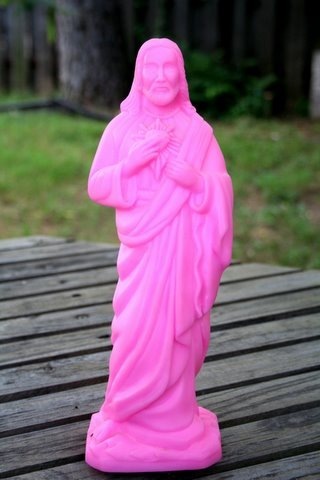 My Pink Plastic Jesus ! This was in my mailbox this morning- put there by a friend who knows me well enough to know that I would have fun with this all day..and I did. It’s about 12″ high, and was constructed with appropriate reverence and awe in China of very durable plastic. I don’t know what area retail establishment Pink Jesus (known already and lovingly as PJ) manifested in, but I’m glad he did- and honored that he now has a hallowed home in Texas. PJ has a secret, too. He is no mere ornament for the backyard garden sanctuary, no! He answers questions! Turn him upside down and he becomes this generation’s Magic 8-Ball ! Same setup: there’s a clear glass window at the base, and bobbing around in some blue liquid within, there is a polyhedron, each face of which is a different answer to whatever one’s questions might be! Today at lunchtime I asked PJ if I should eat watermelon at home or go to Subway for a sandwich. The answer was “Have a nice afterlife!” I took that to mean I should go to Sonic, instead, and have a cheese dog. Later, I queried, “PJ, so that I don’t have to go look, do I have clean socks for tomorrow?” Prophetically, he answered “No chance in hell.” Really! And, glory be, he was correct! A little while ago, we took some pictures together around the house and yard. I’ll share those later. Right now, PJ and I have to discuss tomorrow’s sermon. My life has suddenly become so uncomplicated ! From now on, I’ll always know WWPJD? You got to love friends, don’t you? I’m not sure I could gather my composure for sermon writing with a pink plastic Jesus standing watch. I would probably crack up in the pulpit just reminiscing on the night before. Good luck!